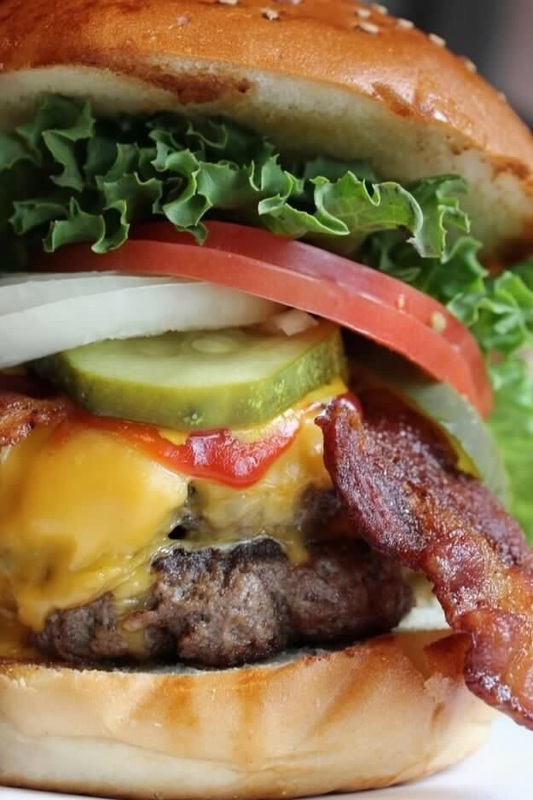 Put Bacon “In” Your Burger! The world is full of good and bad burgers. We’ve eaten many over the years but in all honesty there’s nothing as good as a home made burger. You know just what’s in it and you control the salt. Fast Food burgers are loaded with salt because there’s no love in them! One of our favorite burgers around here has bacon and cheese on it so we thought, why not put the bacon and cheese “in” the burger. 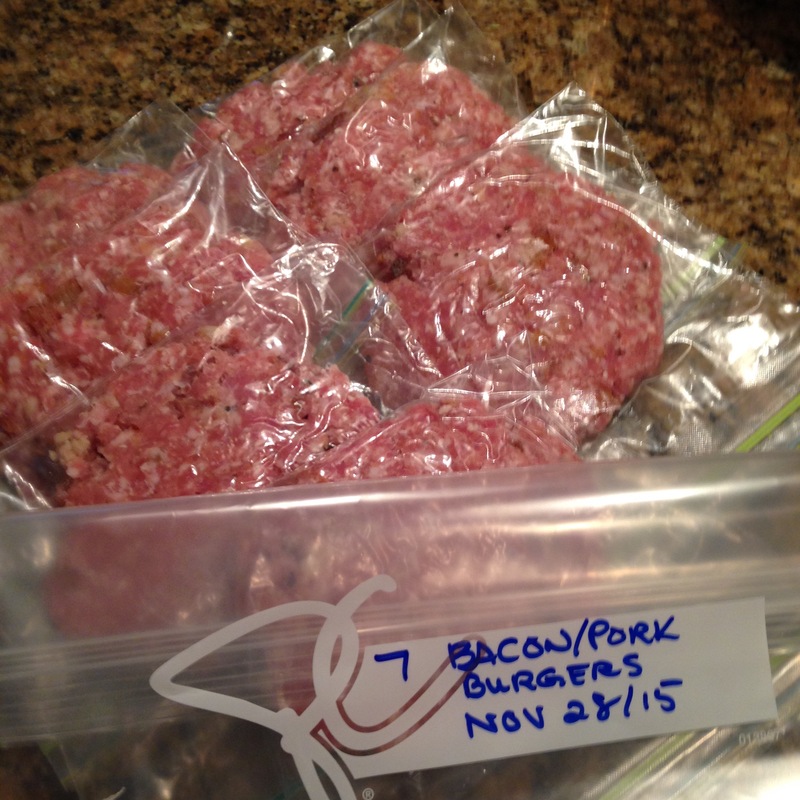 We used lean ground pork for the burger as well. It cooks up juicy, flavorful and loves all your favorite toppings. If you have only ever used beef for your homemade burgers, you’ll want to give this a try. Pork is not a high fat meat but it does have great taste. You can also make this with ground chicken or turkey if you do not eat pork. There are no eggs in these burgers so they are tender rather than dense. Begin by pouring the milk over the bread crumbs in a small bowl and allow to stand until the bacon is fried. Fry the bacon until nice and crisp. 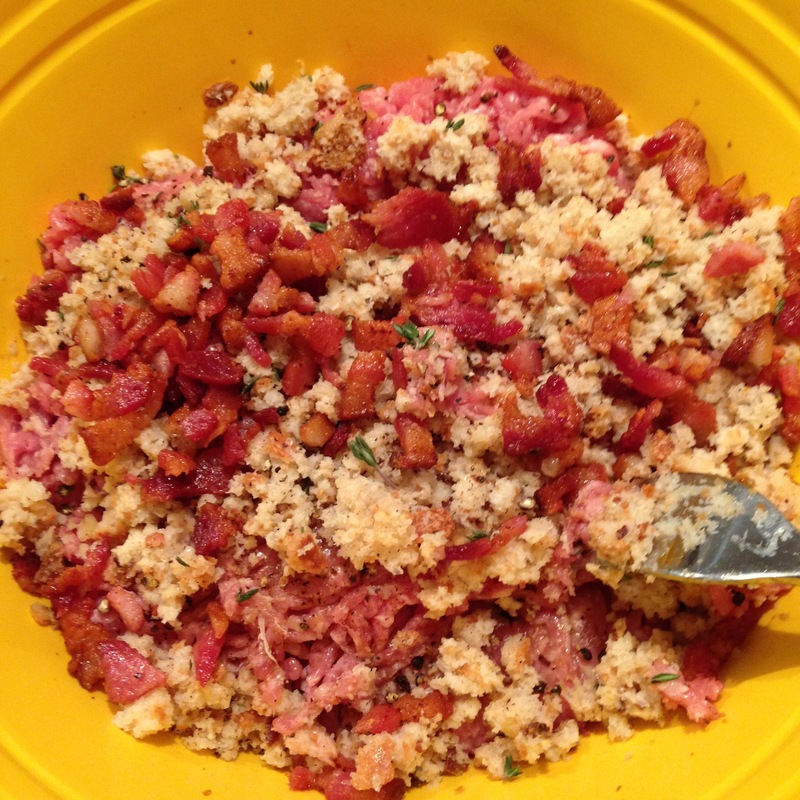 Using a slotted spoon remove the bacon from the fat and place in the mixing bowl with the pork. Add the soaked bread crumbs, the grated cheese and the seasonings. Mix lightly with a fork until you see that everything has been incorporated. Divide the meat mix and form your burgers. We make this large batch and bag them individually so we can cook as many burgers as needed. Notice that we flatten them in the bags so they don’t have to defrost before grilling. These burgers are so rich and juicy you can pan fry them and they will be equally delicious. Never press down on a burger when you are cooking it. This makes it dry.